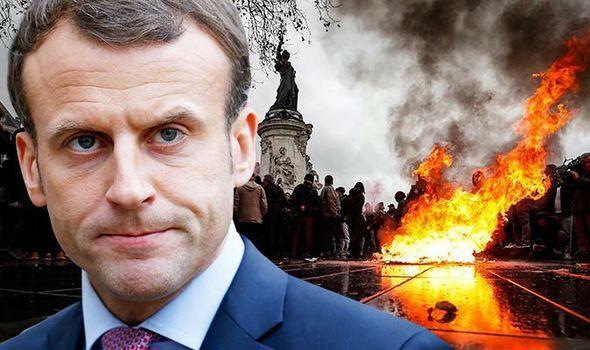 Macron Pens 2,300 Word Letter To Yellow Vests Seeking To Turn "Anger Into Solutions"
After weeks of failing to calm down the Yellow Vest anti-government movement raging into its 9th week across France, French President Emmanuel Macron has resorted to the pen - releasing a 2,300 word open letter to the country which seeks to turn "anger into solutions." Macron says in the letter that he is open to ideas and suggestions but was clear that his government would not reverse previous reforms or key measures from his 2017 election campaign. "No questions are banned," reads the letter. "We won’t agree on everything, that’s normal, that’s democracy. But at least we’ll show that we are a people who are not afraid to speak, to exchange views and debate. And perhaps we’ll discover that we might even agree, despite our different persuasions, more often than we think." The letter, set for publication in French newspapers on Monday, is a new tactic for the Macron administration - marking the first time citizens have been invited to share their views on four central themes; taxation; how France is governed; ecological transition; and citizenship and democracy, reports The Guardian. Macron’s missive asks a number of questions, including: what taxes should be reduced? ; what spending cuts might be a priority? ; is there too much administration? ; how can the people be given a greater say in running the country? Macron said the proposals collected during the debate would build a new “contract for the nation”, influence political policymaking and establish France’s stance on national, European and international issues. “This is how I intend, with you, to transform anger into solutions,” he wrote. The Macron administration has been under intense pressure since a November backlash over a climate change-linked fuel tax morphed into nine weeks of anti-government protests which have spread to nearly a dozen other countries. To try and calm the Yellow Vests down, Macron has dropped the fuel tax, raised minimum wage, and attempted to employ other economic measures amid a "state of social and economic emergency." Thus far, none of it has worked, as the gilets jaunes (yellow vests) continue to picket across the country - calling for lower taxes on food and essential goods, among other things. In his 2,300 word letter, Macron writes that he will accept "no form of violence," including "pressure and insults" against "elected representatives, media journalists, state institutions or public servants." "If everyone is being aggressive to everyone else, society falls apart," writes Macron.